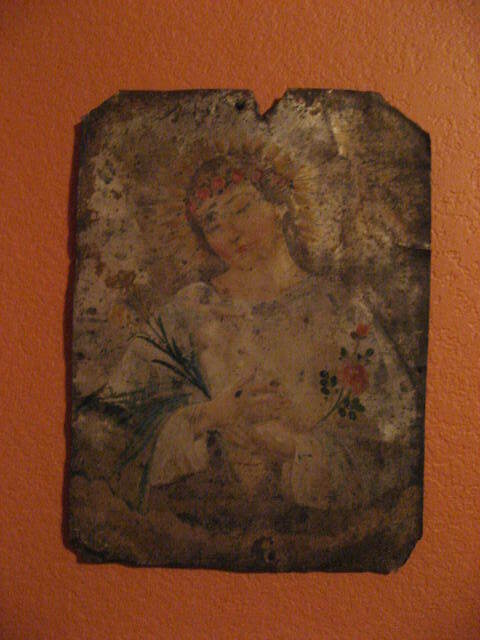 I found this tin painting of Alma de Maria or Soul of Mary (also called Our Lady of Incarnation) at the Tuesday Market in San Miguel de Allende a couple of years ago. It was so faded that you could hardly make out the virgin, but I bought her anyway. I asked my sister, the amazing artist that she is, if she would be willing to gently restore her beauty and clarity, which she did. 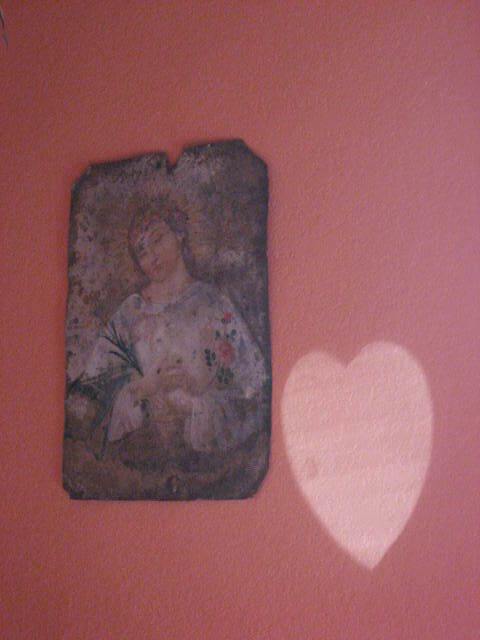 Today at exactly 11:44 am, the midday light shone through the window, reflecting off a Mexican mirror on the opposite the wall, creating this heart of light! I’m thinking it was a Divine message to share this with you today. To honor Mary today, visit Rebecca @http://corazon.typepad.com/. ~ by Dawn Elliott on December 10, 2011.
oooh I love this! such a clear message! I would have wanted to buy that as well. It is aged to perfection ,and beautiful. Your sister did an amazing job on it. And WOW, what a great message to receive! Both the hearts in your photo touch mine! Now that is a vision! All things happen for a reason. Such synchronicity, perfect for our Mary meetings and sharing hearts! That is DEFINITELY a goose bumps moment! How DIVINE!!! each morning we have thrown open the doors to our hearts. we have called out glory, love, compassion. lifting the veil of sacred existence. This is such wonderful synchronicity — hearts of light. What a beautiful synchronicity you shared with us today. What are the chances of that happening? Your sis did a good job of restoration. a message for sure. oh how I love the image you have shared!